I often like to find double meanings in my photos and titles. This photo to me is so odd. 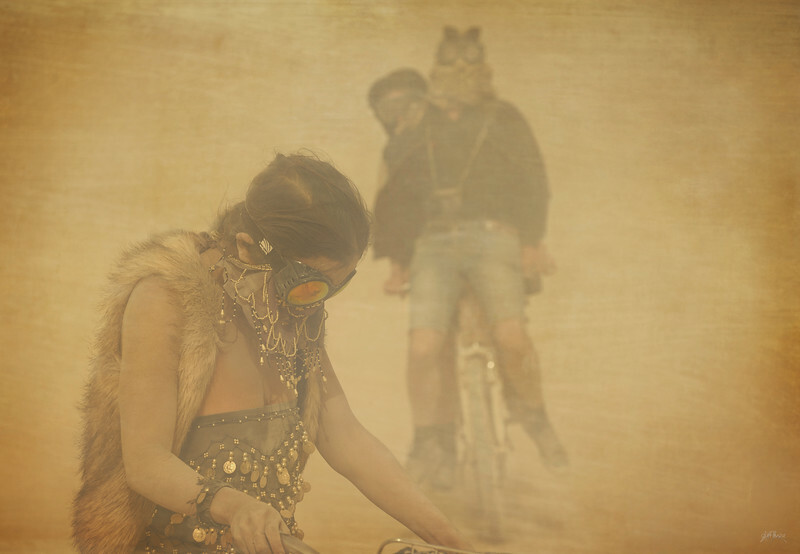 If you didn’t know the location was Burning Man, you’d probably be wondering what the heck is going on here. This was during one of the massive mid-week dust storms. While lots of people go for cover, I like to head out in these conditions for photos. I like the way people naturally pose when they are battling the elements. Usually they are so busy with self preservation, they rarely notice the dreadlocked guy with his giant lens pointed at them. This way, they don’t stiffen up or pose the way they think they should. It all happens with a nice flow. I like the way the guys in the background are sharing a bike. Hence the title of ‘uber’. I personally haven’t tried an Uber service, but it’s an alternative to using Taxi’s to get around town. It’s an app that connects riders with drivers and I think it’s pretty cool. 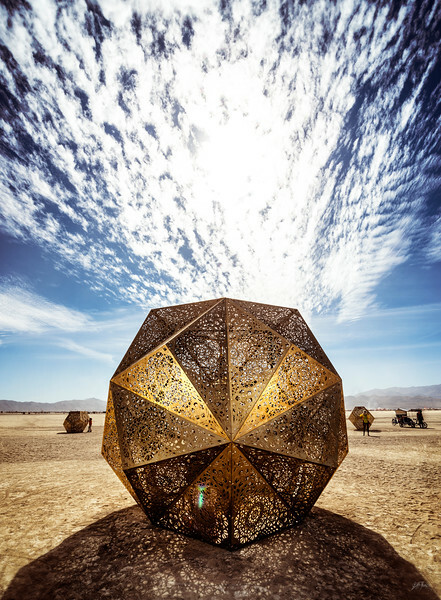 I’m still blown away by the art at Burning Man. I also can’t believe it’s been 5 years in a row now. It’s still just as exciting getting tickets and the whole preparation process. This years Temple of Promise was really a challenge to shoot. Some were calling it the Cornucopia because of it’s shape. Others said it looked to them like a serpent. It had a gigantic copper cowling at the opening. It then tapered down into a single sized doorway which opened up into a strange tree-filled courtyard. The Temple has an effect on me really like no other place. I can feel a real heaviness as I enter. Something is placed heavy on my heart. I begin to read some of the messages and the tears begin to flow. So many tales of lives cut short and loved ones expressing their losses and grief. It gives me an opportunity to send love to each one I read, though. I can see how it heals those who choose to let it. This is Marco Cochrane’s third and final installation of his Bliss project called R-Evoution. It continues the theme of a woman expressing her humanity. I’m always amazed at the engineering that goes into these projects. This one is 48 feet tall and actually breathes! My campmates Edin and Jaci are in this photo. They had a really interesting week, but it all come together in the end for some good times and photo opportunities. They are both really passionate photographers out of Miami. Edin runs a great blog called ShutYourAperture that’s full of photo tips and inspiration. 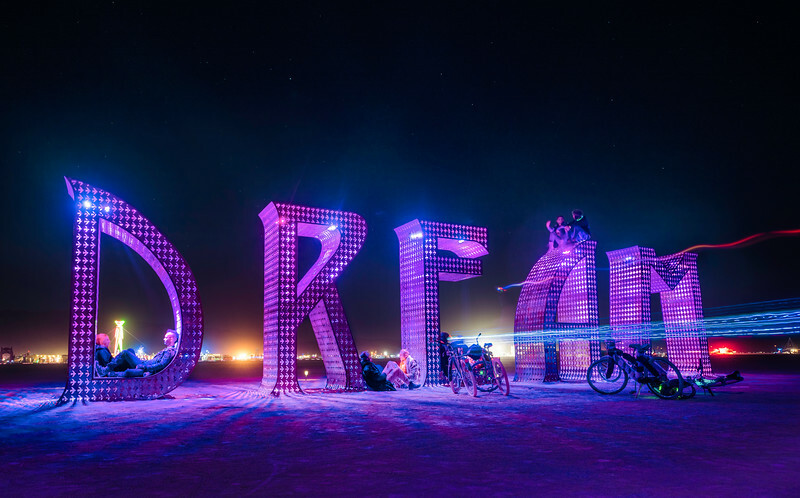 You never really know what is going to happen at Burning Man, but it’s usually pretty intense. 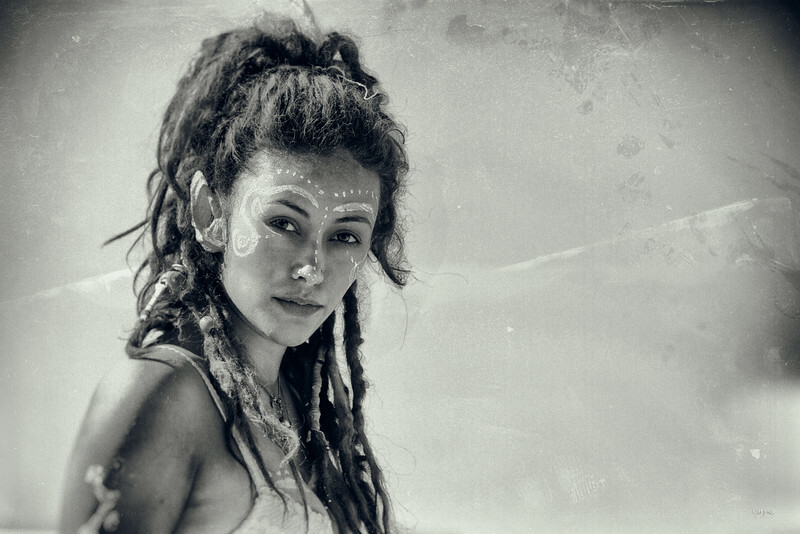 They say not to bring anything to the playa that you aren’t prepared to lose… including relationships. 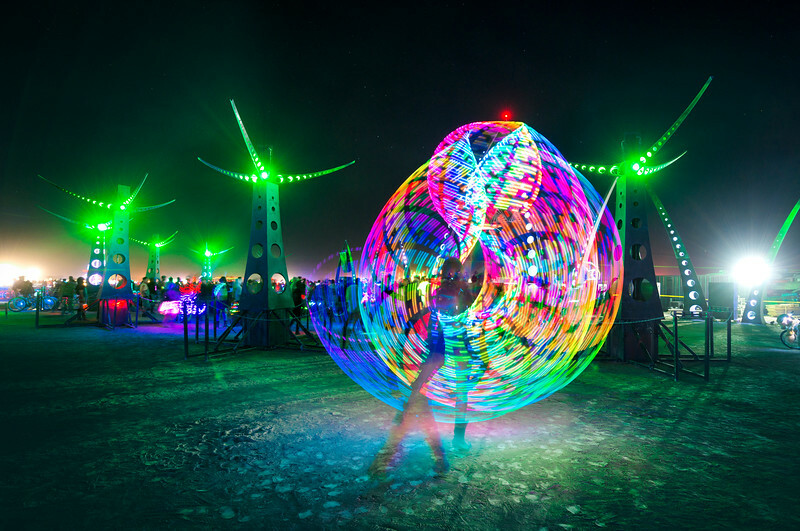 I just love the lightpainting opportunities that Black Rock City provides. All the flow folks come out with their blinky toys and fire gear. I’ve tried to do some of the flow things, but my flow is really with the camera. This girl was rocking this amazing hoop in front of White Ocean. It would change colors and patterns in hundreds of different ways. Every photo I took was really different from the next. This one turned out to be one of my favorites because of its’ cleanliness and the shape that the hoop created. I imagine my burn is very different from a typical burn. I can be found out very late, not looking for a party, but looking for crazy lights or a composition that was unseen during the daytime. 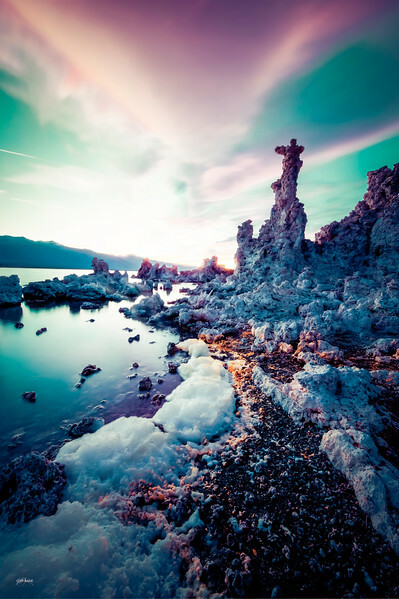 Mono Lake is one of my favorite places that I’ve visited in my short photography career. It’s what I imagine a landscape on another planet would be like. It’s a large, shallow saline soda lake in Mono County, California, formed at least 760,000 years ago as a terminal lake in an endorheic basin. The lack of an outlet causes high levels of salts to accumulate in the lake. These salts also make the lake water alkaline. Mono Lake is best known for its’ unique ‘tuftas’ that rise up out of the water. These make incredible subjects for photography and is visited by thousands of landscape photographers each year, as well as other tourists. During this time while I was there, the sky erupted into a colorful show, and completed what was already an exciting composition. I was running around like a madman trying to get as many different compositions as possible. For this shot I used the Nikon 14-24mm wide angle lens and got down really low. I love that thing. It’s bulbous nature really lets in mega light while keeping it sharp around the edges. This lens does give me a little chromatic abberations on the edges sometimes, but it’s never anything a single click in ACR can’t fix. For a while I’ve been wondering why I spend so much energy and money for one week in the desert. I mean, sure, it’s awesome, but what is my main reason for going? Of all the great things there; the people, the energy, the music, the costumes, the art cars. I would say my very favorite thing is the art. I also love how temporary everything is. The first few years I would take for granted that my favorite piece would be there all week. Hell, you don’t know if it will still be around a minute from now, much less tomorrow. 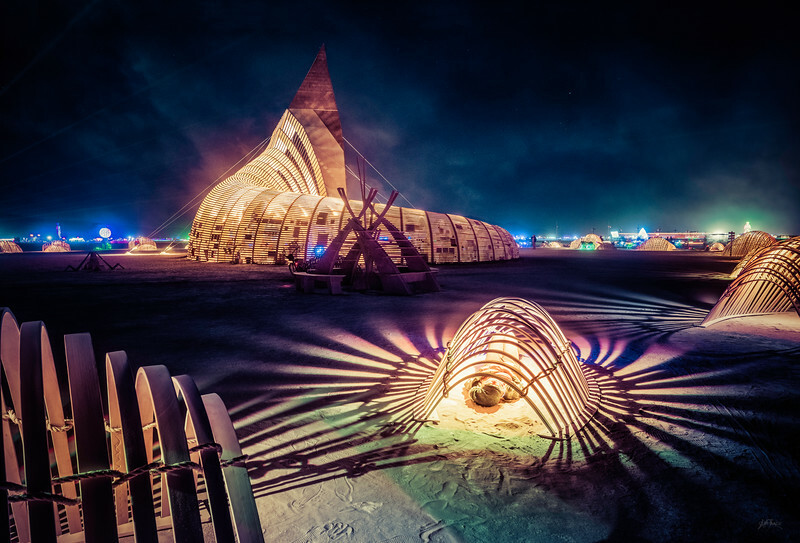 One of my favorite things to do is enjoy art in the default world, why not let it be #1 at BRC as well? I’m really drawn to pieces that use sacred geometry in it’s design. I’m a big fan. In fact I have an entire Pinterest Board dedicated to sacred geometry here. So when I came across this piece, I was really blown away. I love the fact that they are using technology in the construction of these things. It’s the evolution of art. The fine filagree made for the most unique shadow and I like how the clouds above mirror the feel. Being camped at Champagne Lounge in the Middle of Black Rock City certainly has its advantages. There are tons of people that walk down our street “Rod’s Road.” I was able to just hang out under our shade until someone who caught my eye walked by and I would go ask them for a photo. This chick looked totally cool. She was rocking confidence like not many I’d seen. Nothing is sexier than confidence, you know? Anyway, we killed a photoshoot for a couple of minutes then celebrated with a shot of Fireball. I processed this photo using Analog Efex Pro from Google’s Nik Effects. You can get more information on that filter system here.